" I like to add that 365Premium.com is the best hotfile reseller in India. The purchase was done in few clicks safe and easy. Thank you for bringing Hotfile in India. Next time I will purchase Filesonic or Fileserve keepup the good work guys. " Our company "MEGA INDIA" is a registered company in India we are resellers/distributors of File Hosting/Cloud Hosting/Cloud Backup & software services. We have vast experience in selling digital products and are aware of ever changing needs of our customers, we are one step ahead and always on our toes to cater our customers demand. Our company complies with Indian laws and regulations and is registered with respective tax departments. We are a professional company and we take our job seriously. 365Premium.Com is the most popular File Hosting Reseller, delivering fantastic service and low prices across a wide range of premium accounts. We have integrated secured Indian payment gateway & process Credit Cards (Visa MasterCard Diners Club) , Debit Cards (52 Indian Banks) Net Banking (15 Banks) & Cash Cards (Itz) all in Indian Rupees. Our International Payment gateway can process orders in US Dollars/EURO/YEN/INR which include Credit Card (American Express, Carte Bleue, Visa, Discover Network, Diners Club, Maestro, MasterCard, JCB, Solo) , Moneybookers etc..
We support offline payments by Cash deposit, NEFT, Cheque/DD, Offline Net Banking (ICICI, SBI,HDFC) & Western Union. Unlike other resellers we do not auto debit/charge your Credit Card or Debit Card, for each renewal you have to make fresh payment. Online processing of Credit/Debit/Net Banking is not done on our website but carried out by our payment gateway on secured encrypted servers, no critical financial data is stored on our website. We do not share your personal data with 3rd parties. See our security section for more information. 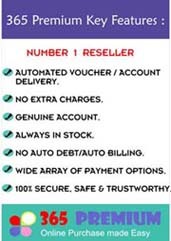 As authorized resellers our customers are always served with "Genuine working vouchers" without delay, there are no hiccups on account of "Stock unavailability"
Customers are welcomed to contact us on email or phone, we also have comprehensive FAQ . Should a customer face any technical problem we do not hesitate to contact the parent company to sort it out.